Delighted to discover these pure pop darlings. London's Wolf Alice is one of those success stories that we love to hear about. Before the extended music blogosphere was praising the group's infectious sounds, frontwoman Ellie Rowsell was a girl that hung out at open mics and shared unknown songs online. Little did she know, these hidden gems would make their way out of the unappreciated alleys of YouTube and into the hands of true music aficionados. Wolf Alice appeals to a far-stretching audience; you will love them if you can appreciate pop, rock, folk, electronic, even grunge. And there really is no denying the beauty of the soft-edged clarity in Ellie's voice – it is absolutely to die for. The four-piece debuted with "Fluffy" this past February and has quickly followed up with Bros which is now available for pre-order. Bros 7" includes two worthwhile sides, "Bros" and "Every Cloud," both of which will literally make you feel like you're floating in the clouds. Despite my initial inclination to associate "Bros" with frat boys or Panda Bear, "Bros" is a delightful pop-electro-dance-meets-folk track that's actually about innocence and friendship intertwined. It reeks of high school weekends spent bumming around, best friends at summer camp, adventures with the neighborhood kids, the certain type of nostalgia that will have you flipping through old photographs and watching home videos in no time. On the other hand, romantic B-side "Every Cloud" is certainly more subdued and experimental. Heavenly harmonies layer to create delicate magic and successfully defy gravity. Needless to say, we've fallen hard for this band in just under seven minutes. 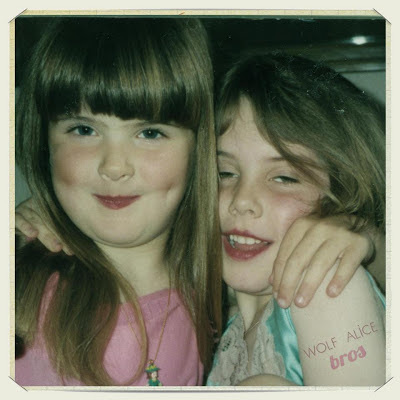 Pre-order Wolf Alice's Bros 7" via Rough Trade.